Although fall is a beautiful time for an outing to a Virginia winery, I most enjoy visiting in late summer when the ripening fruit is still on the vine. This is a good time to chat with the owners, winemakers or tasting room staff, before the busyness of harvest begins. 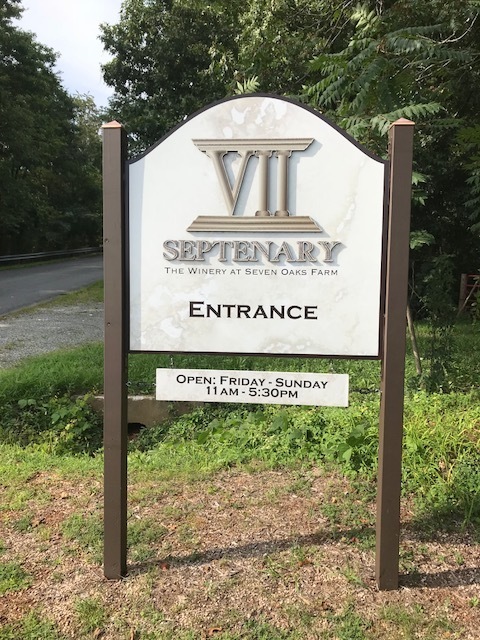 My husband and I visited Septenary Winery in late August and chatted with Sarah and Todd Zimmerman, both UVA alumni. After several decades raising a family and pursing their professional careers out-of-state, they fulfilled their dream of moving back to the Charlottesville area. Their estate, Seven Oaks, is a Virginia Historic Landmark and is listed on the National Register of Historic Places. They purchased the 109-acre property in Greenwood from Coran Capshaw in 2014. The property includes several buildings including the manor house, which was built in 1847; the tasting room, which opened in December 2017; a recently completed production facility, completed late last year; a summer kitchen, after which the rosé is named, a carriage house, and a lovely pool in front of the tasting room. The estate was named for the seven oaks planted in the early 1900s. Each tree was named after a Virginia president. Sadly in 1954, Hurricane Hazel destroyed six of the seven trees. Legend has it that the remaining oak is the one named after Thomas Jefferson. Seven Oaks has seven acres of grapes planted 15 years ago. The vineyard includes: Merlot, Cabernet Franc, Petit Verdot, Syrah and Viognier. They also purchased land in Essex County on the Eastern Shore where they have 26 acres of 35-year old vines: Merlot, Cabernet Sauvignon, Cabernet Franc, Sauvignon Blanc, Chardonnay and Pinot Gris. Winemaker Sebastien Marquet was trained in Burgundy, France, and produced the first vintage in 2014 from the Essex County grapes. The 2015 vintage was the first to include the Seven Oaks gapes. The winery’s name came of a desire to honor the seven oaks concept. However, California based J. Lohr has a Seven Oaks Cabernet Sauvignon so they needed to find an alternative. Their winery’s name is derived from the Latin word “septenary” meaning consisting of or pertaining to the number seven. The label contains a “V” for Virginia and two columns after it, which reflect the architecture of the home and form the Roman numeral seven. The wines are only available for purchase at the winery. A quarterly wine club consists of three bottles per shipment with wine discounts of 15%. A nice bonus for wine club members is use of the private upstairs space on Friday evenings. The tasting room is open Thursday through Sunday from 11 am to 5:30 pm. This is an adult only (21+) establishment. The tasting room fee is $14.00. We enjoyed all the wines we tasted. My favorites were the 2017 stainless-steel Viognier ($30); the 2017 “Summer Kitchen” rosé ($26) produced from estate Syrah with a splash of Sauvignon Blanc from Essex, and the 2015 Carriage House red dominated by Merlot with 11% Cabernet Franc ($35). Sure, you could make a gin and tonic, but why not try something different? White port makes an enjoyable summer aperitif and cocktail! White port is a fortified wine from the Douro region of Portugal. It is made from indigenous white grapes including Malvasia Fina, Gouveio Branco and Esgana Cão, among others. Production of white port is like that of red port, but with a shorter (or non-existent) maceration period. A neutral grape spirit is added resulting in an alcohol by volume range of 16.5% to 20%. Aromas of honey, nut and dried fruits are typical. White ports will have some residual sugar, and sweetness levels range from off-dry to fully sweet. Most producers mature their wines in neutral vessels although some are aged in wood casks to impart color and complexity. The ageing process ranges from 18 months to three years. You can drink it chilled straight up in a white wine glass. A cocktail made of white port and tonic is popular in Portugal. Mix equal parts of white port and tonic in a cocktail glass, add a few drops of orange bitters and garnish with an orange slice and a mint leaf. Or, make a Manhattan with white port and bourbon; equal parts of each and a dash of orange bitters. Want to try it? You can purchase a bottle of Rozés White Reserve Porto at Ivy Provisions for only $29.99. Serve dry white port with almonds, hard cheese, stone fruits, pâté or sushi, and sweet white port with a light dessert such as sponge cake or fresh fruit. I spent three days in the Hunter Valley wine region of Australia in July. Located 1½ hours’ drive north of Sydney in New South Wales, the region is considered the birthplace of Australian wine. The Aboriginals were the first to occupy the area. European settlers arrived in 1797 and the first road between Sydney and Newcastle was built by convicts between1826 and1836. The first vines were planted in the early 1800s. By 1823, some 20 acres of vineyards had been planted on the northern banks of the Hunter River. After an extensive study tour of Europe’s wine growing regions Viticulturalist James Busby arrived back with a collection of some 500 vine cuttings drawn from collections and private plantings. By 1840 the Hunter Valley’s registered vineyard area exceeded 500 acres. In the latter part of the 19th century four families established vineyards in the area; the Tyrrell, Tulloch, Wilkinson and Drayton families, alongside the well-known Dr Henry Lindeman. The area which is divided into six sub-regions: Broke Fordwich, Lovedale, Mount View, Pokolbin, Upper Hunter and Wollombi Valley, and covers almost 9,692 square miles. Production in Hunter Valley is only 3% of total Australian wine production. It is the warmest wine producing region in Australia. Over 150 wineries produce a wide array of exceptional wines and are renowned for producing some of the world's best and most distinctive styles of Semillon, Shiraz and Chardonnay, which are the hallmark of this region. Other varieties grown include Cabernet Sauvignon, Merlot, Pinot Noir and Verdelho. We visited seven “Cellar Doors” as they are referred to there. My favorite wines came from Tyrrells, a fifth-generation winery celebrating 160 years. Each generation has made its own mark on the business, which was originally started by Edward Tyrell, an English immigrant who purchased 320 acres at the foot of Brokenback Range in 1858. Decades later Murray Tyrell would make his mark and is credited as the father of wine tourism as he started the work to bring people to the Hunter in the very early 1960s. Today, Bruce Tyrell (mid-60s) feels his contribution is the development of the Semillon varietal wines. In a recent article in Wired, “Your Next Glass of Wine Might be a Fake – And You’ll Love It” by Bruce Schoenfeld, I read about a company that is making reproductions of popular premium wine brands by analyzing the chemistry and selling it at a lesser price than the name brand. In 2001, Ari Walker started a wine import and distribution company with business partner Kevin Hicks. In 2012, Hicks formed Ellipse Analytics and invested several million dollars in equipment and hired a team of scientists and technicians to analyze consumer products such as baby food, sunscreen and protein powders. Hicks recognized the potential for wine and began testing some 500 different attributes including esters, acids, proteins, anthocyanins and polyphenols. In 2015, Walter and Hicks started Integrated Beverage Group and set out to duplicate popular wines under the brand Replica Wine. Two years after IBG was formed the brand is now sold in 49 states, including Virginia, and sold through Republic National Distributing Company. Over the past four years Ellipse has analyzed thousands of wines. The IBG team can match highly respected brands in blind tastings. Red wines are easier to replicate than white wines and can come within a few percentage points of matching the components of the brand name wine at a parts-per-billion level. Inexpensive bulk wine is used as the base and enhanced with additives. Their position is that this is not any different than what a winemaker does from acidifying wines in a warm vintage or adding tannins, blending in other varietals, using commercial yeasts and reducing alcohol. They admit that they cannot duplicate every wine, particularly those from grapes grown in a specific vineyard and lesser known varietals. Winegrowers and winemakers seek to find the geological compositions and terroir that will grow the finest wine grapes. Many wine soils are defined by their textures, which are comprised of types of igneous, sedimentary and metamorphic rocks. The different soil textures produce different characteristics in wine. Sandy Soil has rock that has been pulverized into small particles. It is well-drained and retains heat. The wines have high aromatics, pale color and low tannin. Clay-Based Soil stays cooler and retains water. This texture produces muscular wines with structure, high extract and color. Silt/Loess Soil produces smooth and round wines with less acidity. These fine-grained soils retain water and heat. While this type can be too fertile, one good variety is loess, a type of wind-blown silt comprised mainly of silica. Loam Soil is nearly an equal mix of silt, clay and sand, as well as an organic matter called humus. Loam is very fertile and typically causes vineyards to be over vigorous, which can render wines that have little flavor or color. Gravel Soil can range from the size of a pebble to the size of a fist. Gravel drains freely, absorbs heat and reflects it onto grape varieties, particularly at night when temperatures drop. This is a good soil for Cabernet Sauvignon and other late-ripening grapes but can cause water stress in Merlot and other varieties. Alluvial Soil is comprised of a combination of clay, silt, sand and gravel that has been deposited over many years by running water. It typically contains a lot of organic material and is present in many of the world’s wine regions. Limestone Soil contains fossils of ancient marine life and is high in calcium. These soils can form impenetrable layers that block roots. The term “marl” describes a crumbly mixture of clay and limestone. The Cote d’Or region in eastern France contains a calcareous marl that produces good Chardonnay. Chalk Soil, a type of limestone, is soft enough for roots to grow in and is cool. It holds enough water to nourish vines, yet it drains well. Its calcium content makes it alkaline, producing grapes with a high acid content. Pure chalk soils are found in the famous Champagne region of France. Volcanic Soil is comprised of basalt and other rocks. Volcanic soils of Napa Valley of California have a high mineral content but hold little water; the vines lack vigor but are good for producing wine. You may have enjoyed a wine made from the Gamay grape varietal, but not even realized it. If you have tasted Beaujolais Nouveau at Thanksgiving, then you have tried Gamay. These inexpensive, young, light and fruity wines are fermented for just a few weeks before being released for sale on the third Thursday of November. Beaujolais is a French wine appellation and geographical region at the far south of the famous wine region of Burgundy, more well-known as the home of Pinot Noir. As is typical in Old World winemaking regions, the wines are referred to by the name of the region instead of the grape. There are three levels of Beaujolais wines. The first level is labelled Beaujolais, the second level is Beaujolais Villages (where the grapes are grown in specified communes) and the third level represents the ten 'crus' where the premium wines are made (Brouilly, Chénas, Chiroubles, Fleurie, Morgon, Moulin-à-Vent, Saint-Amour, Juliénas, Côte de Brouilly and Régnié). Wines in this last group are more full-bodied, darker in color, and are significantly more ageworthy. This cru category offers dependability, quality and affordability for wines from Burgundy. Gamay makes a great spring and summer red. I love this Morgon wine that we’ll be tasting on May 16. Low tannins and medium body with ripe cherry and blackberry fruit. Perfumed, smooth and mouth-filling with alluring damson fruit, balanced acidity and a mineral finish. Aged for 10 ten months in oak. Wine Enthusiast 90 points. Wine labels provide information for consumers. Some of this info is required by the country where the wine is made and some from the country where the wine is sold. Optional info such as tasting notes or technical data may be present. It is often a striking graphic design on the label that draws your attention to a bottle, but if you understand the various label elements it will help you to choose your wine wisely. Winery/Chateau Name/Brand Name – Many producers have names for individual wines in a portfolio which is different from the winery name. Wine Type – A general description of the wine category will tell you if it is white or red, sparkling or dessert. Grape Varietal – Wines from New World regions (U.S., Argentina, Chile, etc.) list the varietal on the label. Country of Origin and Region – Old World European wines often do not list the varietals on the label. Instead you will find the regions, i.e. Bordeaux, Barolo, Burgundy, Rioja or Douro. American Vinicultural Region (AVA) – An AVA is a designated U.S. wine grape-growing region distinguishable by geographic features with boundaries. Appellation . . . Contrôlée (AOC) – The French put the name of the official place and location where the grapes grew in between the first and second word of this phrase. Denominazione di origine controllata (DOC) – An Italian controlled designation of origin classification system and Denominazione di Origine Controllata e Garantita (DOCG), controlled and guaranteed designation of origin. Vintage Year - The year in which the grapes were harvested is known as the vintage. If no vintage appears the wine is made from grapes of more than a single year. This is common with Champagne. Estate-bottled – This indicates the grapes were grown at the same place the wine was bottled. Alcohol Level – A statement of alcohol content in percent by volume appears on most labels. As an alternative, some bottlers may label wine with an alcohol content from 7 to 14 percent as "Table Wine" or "Light Wine". Net Contents – A standard bottle contains 750 milliliters. Contains Sulfites - The phrase appears on most bottles. Certifications - There are a number of certifications including Organic, Salmon Safe, Certified Sustainable and Biodynamic that wine producing regions use to indicate how grapes were grown and wine produced. Dryness Level – Sparkling wines use a term that indicates how dry or sweet the wine is. A sparkler that is labelled as ‘’Brut” is drier then one labelled “Extra Dry”. Government Health Warning – The notification about the danger to one’s health, pregnant women and the risk of operating machinery must appear on the label. Quality Designations – You may find descriptors such as reserve or grand cru. Name and Address – This will be where the wine was bottled or the importer’s location. I just finished reading Gourmand’s Way by Justin Spring, 2017. It is a factual account of six Americans living in France following World War II; each had a passion for French food and wine. Of the six individuals, you know Julia Child, but what about Alexis Lichine? He introduced French wine to generations of Americans! He understood the French culture where wine is an indispensable element of daily life and meals. He envisioned the extraordinary potential for French wines to the American market. And, the timing was right as France was very eager to renew their overseas trade in wines. Lichine was born in Moscow. The family fled to America during the Revolution in October 1917, when he was just four years old, but they relocated to France. He lived between both countries for his entire life. He studied at the University of Pennsylvania for a time. In 1935 he worked for the Cork and Bottle retail store in New York and became a United States citizen. He served in the American armed forces during the war where he became the aide-de-camp to the then General, and future President, Dwight D Eisenhower, who appreciated his extensive knowledge of wine. (This would be a good Jeopardy question.) He was a successful New York-based wine salesman with a luxury apartment in Manhattan, a self-proclaimed “merchant of pleasure”. He published his first book, The Wines of France, when he was thirty-seven. He played a key role in promoting varietal labelling of wine and convinced California vineyards to put the name of the grape on the label, making it easier for wine enthusiasts to choose. Today, this system is broadly used all over the world. Lichine purchased Château Prieuré-Cantenac, 15 miles from Bordeaux, France. It was promptly renamed Château Prieuré-Lichine and renovated. He also had a controlling share of Château Lascombes. He founded a shipping company in France, Alexis Lichine et Cie. In 1966 Lichine sold his exporting company, bottling line, import side of the business in New York and inventory to Charrington United Breweries. Unfortunately, he unwittingly sold the rights to his name. Company executives began purchasing only average or below average wines, much to his dismay. Decanter wine magazine voted him “1987 Man of the Year”. He had two children, one a son Sacha, who is now the owner of Château d’Esclans, and produces “Whispering Angel” rosé from Provence. He was married three times; his third wife was the actress Arlène Dahl. He lived out his last years in Bordeaux, France and was buried there in 1989 at age 76. Sicily is the largest island in the Mediterranean Sea with a 600-mile coastland. It is one of Europe's oldest vinicultural regions with its fertile soil and long summers with little rain. The oenological history of the island dates to as early as 1,500 BC. The Greeks introduced several varieties of vines when they began to settle in Sicily in the 8th century BC. In 1773, John Woodhouse started producing Marsala, Sicily’s most famous wine. Until about five years ago, nearly 75% of wine produced in Sicily was not bottled and shipped to be used in wine made elsewhere in Italy. New generations of winemakers are concentrating on choosing the right sites for the right grape varieties, yields have dropped and investments in marketing and vineyard practices have improved quality. Today, most of Sicily’s wine is bottled and some of the best houses make excellent wines that because of the small quality are only enjoyed by locals and visitors. As Sicily's wine tourism grows steadily, the destination was just named one of Wine Enthusiast Magazine's 2017 “10 Best Wine Travel Destinations” for the first time. The island's wine tourism is largely influenced by a consortium of 130 Sicilian wine producers committed to preserving and promoting Sicily's winemaking industry. There are 23 denomination of origin (or "appellation" abbreviated D.O. or D.O.C. ), and one D.O.C.G. wine: Cerasuolo di Vittoria. International grape varietals including Chardonnay, Cabernet Sauvignon and Merlot are grown. The native or indigenous Sicilian grape varieties are important in wine production. The red grapes are: Nero D’Avola, Nerello, Perricone, Primitivo, Frappato, Gaglioppo, Zibibbo, and the whites: Cataratto, Grecanico, Grillo, Inzolia, Zibibbo, Damaschino, Trebbiano, Ausonica, Moscato Bianco, Carricante, Corinto Nero. Our March 8th tasting features the wines from Villa Pozzi, each varietal priced at only $9.99! Pinot Grigio – A fragrant, richer Pinot Grigio than you might expect. It showcases aromas of lemon, white peach, and pear. It’s clean and well balanced with bright acidity, and the finish lingers with notes of stone fruit and flowers. Nero d'Avola – The most important indigenous red grape in Sicily. This wine reveals aromas of blackberry, white flowers, vanilla and a hint of figs. On the palate it is opulent and full-bodied with sweet tannins. Cabernet Sauvignon – Twenty percent of the wine is aged in oak barrel while the rest is finished in stainless steel, leaving just a hint of warm vanilla to round out the rich fruit character of the grape. February is a great month to watch films that celebrate the world of wine. From documentaries to comedies to romances, the story of wine is as complex as is a good glass of wine. We’re offering wine, food and movie pairings to make the experience an event! Save $2 on any lunch sandwich and 750 ml bottle of wine through February 28. Try our suggestions or pick your own. 1 | The Secret of Santa Vittoria (1969) - This is based on Robert Crichton’s 1967 novel of the same name. In 1943, the German army occupies the Italian hillside town of Santa Vittoria in the Marche winemaking region. The troops want to confiscate the region’s prized wine, but the cunning, oft-inebriated mayor (Anthony Quinn) and townspeople conspire to and successfully hide one million bottles in a cave. 2 | Year of the Comet (1992) - Boy gets girl in this caper, in which a young wine professional (Penelope Ann Miller) uncovers the most expensive bottle of wine in the world in the cellar of a castle in Scotland. Tim Daly plays the part of her partner in fending off thieves in their attempt to bring the large format bottle of Bordeaux, from the vintage of the Great Comet of 1811, to auction. 3 | A Walk in the Clouds (1995) - A beautiful, unmarried and pregnant woman meets a married soldier (Keanu Reeves) returning home from World War II. She tells him about her family’s Napa vineyard and the three generations that live there. She fears her father’s harsh and overbearing response to her situation and the soldier agrees to temporarily pose as her husband to save her honor. They fall in love and the story unfolds in the vineyard. 4 | Sideways (2004) - After the release of this movie Pinot Noir sales increased and Merlot sales decreased. The setting is California wine country where Miles (Paul Giamatti) and Jack (Thomas Haden Church) embark on a week-long road trip just before one is about to be married. They are seeking the perfect bottle of wine! 5 | Bottle Shock (2008) - In this comedic drama, Alan Rickman portrays Stephen Spurrier, an English wine merchant and Sommelier, who set up the Judgment of Paris. The 1976 blind tasting pit American wines against France’s best. Chateau Montelena in Napa won the Chardonnay competition and made the winemaking region famous. The film also chronicles a tumultuous father-son relationship that grows into trust. 6 | Somm (2012) - During nearly 40 years, only 220 professionals worldwide have passed the Master Sommelier exam, which is considered one of the crowning achievements of wine knowledge. This documentary follows four candidates as they swirl, sip and study for the test. 7 | Red Obsession (2013) - A stunningly shot documentary narrated by Russell Crowe about the Bordeaux winemaking region in France. Interviews with wine professionals and winemakers provide insight into China’s relentless pursuit of luxury Premier Crus and how it affects these chateaus and sets the prices in the global economy. For the Chinese, the brand recognition of prestigious bottlings is a symbol of what they have achieved and Western culture. I have really enjoyed watching these films! I hope that you do too! Do you make resolutions for the new year? I’ve always been a results-oriented person and typically commit to a few goals that I want to accomplish. The year 2017 will be no different. I’ve already made plans to travel to Italy in October and have applied to the master gardener program. Even if you are not the resolution type, it's fun to learn more about wine. Here are ten ideas to try in 2017. Discover New Grape Varietals – Chances are you know the popular international grape varietals such as Chardonnay, Merlot and Cabernet Sauvignon. Pick a country such as Portugal or Italy and explore their indigenous grapes. Drink Globally – Explore all of the wine producing countries. The top ten countries (2015 data) are: France, Italy, Spain, USA, Argentina, ChinaAustralia, Chile, South Africa and Germany. Perform Blind Tastings – This is a sensory examination and evaluation of wine that improves the individual’s ability to describe the perceived flavors, aromas and characteristics of a wine. Build a Wine Collection – Having a well-matched wine on hand to go with any meal or occasion is essential for any wine enthusiast. A small collection of 50 to 75 bottles is a good starting point. Visit Local Vineyards – We are fortunate to live close to the many wineries in the Monticello American Viticulture Area (AVA). If you have visited all of those wineries, then consider exploring another Virginia AVA. Plan a Wine Destination Vacation – There are many to consider in the United States as well as in Europe and South America. One of my favorite wine vacations was Willamette Valley, Oregon, well-known for their Pinot Noir and Pinot Gris. Buy a Case of Wine to Age – Wine will mature over the course of several years. Buy a case of age worthy wine such as Napa, California Cabernet Sauvignon and open a bottle every year or so to see how it has changed. Take an Online Wine Course – The winter season is a great time to take an online wine course or read one of the many wine books available. Diversify – We all have our favorite varietals or regions, but look to broaden the group of wines that you know and enjoy. Start a Wine Club – Gather a group of fellow enthusiasts who want to meet regularly to taste and learn. You’ll need to pick a theme, a budget and the meeting location. VIRGINIA WINE MONTH: Our Picks! OCTOBER is Virginia Wine Month and it is rapidly coming to a close. Hopefully you have had a chance to learn more about Virginia wine by visiting a winery or two. If not, you still have time this coming weekend! Many of us are very familiar with the wineries in the Central Virginia area. According to the “2016 Virginia Winery Guide” there are 65 wineries to explore within about an hour's drive of Charlottesville. This year we decided to learn more about the Northern Virginia winemaking region (88 wineries). On Saturday, Oct.15, my husband and I made the 2½ hour drive to attend “Epicurience Virginia” in the heart of Loudoun County. The education tent featured winemakers, sommeliers, and local food producers and covered a range of topics on Virginia wine including geographic terroir, varietals, culinary pairings, and more. Four seminars ran mid-afternoon and our good friend Matt Brown of King Family Vineyards, was on the panel of two of them. The wineries attending the event were: 8 Chains North Winery, Bluemont Vineyard, Breaux Vineyards, Horton Vineyards, Maggie Malick Wine Caves, North Gate Vineyard, Stone Tower Winery, Sunset Hills Vineyard, Tarara Winery, The Vineyards & Winery at Lost Creek, and Zephaniah Farm Vineyard. 2015 Lovo Vino – A blend of 30% Viognier, 30% Albarino, 20% Traminette and 20% Sauvignon Blanc. Light-bodied and fresh with tropical fruit notes and bright acidity. Aged in stainless steel. Pairs perfectly with cheeses, salads, or crab cakes. 2015 Rkatsiteli – Possibly the oldest vinifera grape on the planet. Its accepted origin is in Georgia’s Caucasus Mountains bordering Armenia and Turkey. Crisp and bright! Great with oysters on the half shell. 2012 Cabernet Franc Reserve - Aromas of cherry, cinnamon, and floral notes with flavors of fresh pomegranate, red fruit, black cherry and herbs. The wine has received the following accolades: Gold Medal at the 2016 Virginia Governor's Cup and Governor's Cup Case, Silver Medal at the 2015 San Francisco International Wine Competition, Silver Medal at the 2015 Atlantic Seaboard Wine Competition and Silver Medal at the 2015 Loudoun Wine Awards. Additionally, Doug Fabbioli was recently named “Winemaker of the Year” at the second annual Loudoun Wine Awards. Boudica’s Uprising - Honey mead is mankind's oldest alcoholic beverage. This is a naturally carbonated sparkling semi-sweet mead made with all-natural 100% True Source Certified Grade-A honey. It contains no added sugar or high fructose corn syrup. The US Federal Government considers mead a wine. Enjoy the fall weather with friends and family at a Virginia winery! I have wanted to go to the Santa Fe Wine & Chile Fiesta for at least a decade. My husband, Bob, and I recently traveled to New Mexico, flying into Albuquerque, where we met our good friends from New Jersey. Together we rented a car for the hour long trip to Santa Fe for five days of fun in an adobe style home just off Canyon Road. The highlight of the 26th Wine & Chile Fiesta was the Grand Tasting on Saturday, September 25, where 75 great Santa Fe restaurants, 90 world-class wineries and 3,000 food and wine enthusiasts gathered on the grounds of the Santa Fe Opera, in full view of the Sangre de Cristo Mountains, under a very blue sky. I had reviewed the list of participating wineries and had a plan of attack for the 3-hour event. Our friends are California Cabernet Sauvignon lovers and they took off in a different direction. There were some fantastic wines and I selected bottles that I had not had before. Although I thought the wine would be the focus at the event, very early on (like the first table) it turned out it was the food. I tasted as many different dishes as possible. The food was simply AMAZING!!! We feasted on sautéed scallops in a mango chipotle cream sauce, ice cream with chocolate chile sauce, squash blossom tempura with toasted almond and saffron sauce, smoked duck breast with fig mole, pork carnita tacos, Frito pie, chargrilled lamb chop, Sicilian brittle with coconut rum pastry cream and fresh strawberries, braised bison short ribs, tuna tacos, coq au vin pot pie, spicy tuna salad and black rice with warm coconut milk. It went on and on and we ate until we could not hold another bite. We also attended one of the many wine seminars offered the day before the Grand Tasting, “Grower Champagne.” In addition to the tasting and seminars, wine dinners were held at various local restaurants where special menu items were paired with wines being showcased in the festival. We ate at La Plazeula at La Fonda where the featured wines were from the Michael David Winery in Lodi, California. New Mexico is a wine region containing an incredible variety of vineyards, wineries, and tasting rooms amidst the low and high-desert vistas of the state. New Mexico Wine Growers Association website lists more than 50 wineries spread around the state. The economic impact in the state exceeds $60 million and production is expanding by 10 to 15 percent annually. In addition to the wine fiesta there is great hiking in the area, along with an abundance of fine art galleries, boutique shops, fabulous restaurants and spas. It is definitely a vacation destination! When I became of legal drinking age in the mid-70s (18 then) my favorite wine was Mateus Rosé from Portugal. And, I was not alone in my love of it. At the time It was the most popular wine in the world. Even the Queen of England liked it and Jimi Hendrix was photographed drinking it out of the bottle. The bottle's shape was super cool and when empty, we dripped colorful candles onto it. It’s been a long time since I tasted it, but I remember it to be slightly effervescent, with good freshness and balance, and off-dry. It brings back many memories of my youth and the era. Since joining the European Union in 1986, Portuguese winemaking regulations and quality guidelines now mirror those of other European countries. They have experienced three decades of progress to become a modern winemaking industry and compete in the international market with wines that have universal appeal. And, yes, they still produce Mateus. Two fortified wines from Portugal are well-known: Madeira and Port. Portugal is also a major cork grower, producing about half the world output of commercial cork. But, its table wines have not received much attention, except by locals, until the last decade. The wine appellations in Portugal are classified as D.O.C., Denominacao de Origem Controlada. The main regions are 1) Douro (center of Port production and elegant wines similar in style to Bordeaux); 2) Dão ( known for its big, full-bodied red wines); 3) Bairrada (highest D.O.C. wine classification); 4) Vinho Verde (bright and zesty wines from the coolest, northernmost wine region); 5) Terras do Sado (a peninsula area bordered by the Atlantic Ocean and two rivers: Tejo and Sado) and, 6) Alentejo (one of the warmest regions that covers one-third of the landmass). Much of the wine is produced with indigenous grape varietals, and vinified as blends. For whites you find Loureiro, Arinto, Malvasia Fina and Alvarinho (known as Alvariňo in Spain). For reds it is Touriga Nacional, Tinta Roriz ( Tempranillo in Spain), Baga, Castelao and Trincadeira. Merlot is the second most planted red grape varietal in the wine-making world. Time to revisit the varietal! 1 / Merlot is a red grape that originates from the famous Bordeaux winemaking region of France. There it is primarily a blending partner with Cabernet Sauvignon and Cabernet Franc. The country has more Merlot acreage than any other country and it is the most widely planted grape in France. 2 / The DNA of Merlot reveals that it is the offspring of Cabernet Franc (the father) and a now extinct varietal, Magdeleine Noire des Charentes (the mother). 3 / Merlot is one of the three red noble grapes (the others are Cabernet Sauvignon and Pinot Noir). The grape commands the highest respect in the professional wine world. 4 / The movie “Sideways,” (2004) starring Paul Giamatti, caused a drop in sales of wine made from Merlot (many vines were pulled out and replaced with Pinot Noir). Merlot sales are rising and consumers are enjoying the wines again. 5 / It produces a dry, medium to full-bodied wine with red fruits such as plums and blueberries. It has lower acidity and softer tannins than Cabernet Sauvignon. 6 / Climate dictates the style of the wine. A cool climate Merlot, i.e. France, is more structured, leaner, possesses a higher presence of tannins and shows more herbal and earthy flavors. 7 / Warmer climate Merlot from Argentina, Australia or California, is more fruit-forward and lush and the tannin is less prevalent. The alcohol content can approach 14.5% when grown in warmer climates. 8 / Oak ageing adds structure and complexity to the wine. Light oak ageing can add notes of vanilla, coconut, violet, caramel and cloves. Heavier ageing adds smoke, toast, truffle, mushroom, earth, coffee, leather, cedar and cigar box notes. 9 / The skins of Merlot are thinner and more sensitive to the climate than Cabernet Sauvignon. It ripens more rapidly though. 10 / The best food pairings for Merlot are steak, beef (grilled, roasted, prime rib), lamb, pork, chicken, duck, pâtés, charcuterie, and caramelized roast vegetables. Have you ever wondered why one bottle of wine costs $65 and another $15? There is much more to the cost of a bottle than the wine inside. While only the consumer can make the final judgment as to what a bottle is worth, this article highlights some of the factors that are associated with the retail price that you pay. Alcohol Taxes: According to http://www.tax-rates.org/virginia/excise-tax#WineTax, Virginia has one of the highest wine taxes at $1.51 per gallon. Our state's excise tax on wine is ranked #7 out of the 50 states and is already added to the purchase price of all wine bought in Virginia. Distribution Costs: For less expensive and mid-range wines, the economics of distribution must cover production cost, taxes, import duties, transport and the various markups. For the pricier bottles the rules are less straightforward and price is more independent of costs. Oak: Ageing wine in oak barrels costs more than producing it in stainless steel. Prestige: Brand names dramatically affect price. High end packaging, well-known and respected winemakers, advertising, location (terroir) and grape varietals all contribute to the price. An exclusive wine brand will command a premium, just as it does with clothing or automobiles. Time: The ageing of wine in oak barrels for a year or more and/or in a winery’s cellar enhances the drinkability of quality wines. An example of a red wine that improves with ageing is an Italian Barolo. Volumes: Almost all the high-priced wines around-the-world are produced in small amounts and typically command a higher price. The difference in volumes between small production and massive production explains why wines cost less at big box retailers like Costco, where wines from boutique wineries are rarely found and retailers take extremely small margins, but make it up in the volume sold. Please do not hesitate to contact me at wine@ivyprovisions.com with any questions on the above or if I can help you with any of your upcoming wine needs. Viognier (pronounced VEE-ohn-yay) is well-known to many wine lovers in Virginia. It is believed Dennis Horton of Horton Vineyards was the first to plant the grape in the state. He released his first vintage of Viognier wine in 1993. The varietal was designated as the state grape in 2011 by the Virginia Wine Board, and is on the tasting list at local vineyards. Its origins go back to France, and in particular the Northern Rhone, where it is the main white grape of the French appellations of Condrieu and Chateau-Grillet. A small percentage is often blended with Syrah to add an aromatic bouquet to the red wine. In 1965 only eight hectares of Viognier was planted in the Northern Rhone. It wasn’t until the 1990s when the amount of land dedicated to Viognier started to gradually increase in the Rhone and throughout other winemaking regions around the world. Today you can easily find a range of single varietal Viognier wines from France and Italy in Europe; from Virginia and California in the U.S; from Chile and Argentina in So. America; and from Australia and South Africa. Viognier can produce a full-bodied lush character which includes fragrant notes of honeysuckle, jasmine, gardenia orange blossom, stone fruit flavors like peach and apricot and a spice component. The aromatic quality of the wines hint at sweetness, but the taste is actually dry. Although low-acidity Viogniers do not require oak ageing to provide balance, some restrained use of French oak can enhance the overall flavor. The wines often have between 13 and 14 percent of alcohol by volume. A glass of Viognier is on its own causes you to pause and think about all of the aromatic and taste nuances. It is also a food friendly wine that pairs with chicken, pork, seafood, spicy Thai cuisine, tangines, roast turkey, dishes with fruit salsas and coconut. Cold beer may be the first thing that you think of when it comes to purchasing beverages for barbecue fare, but the right wines can be just the thing you need to enjoy with your spread. The ribs, sausage, brisket, pulled pork, chicken, seafood, grilled corn, vegetable kabobs and watermelon are sure to take center stage, so you’ll want to purchase affordable wines that will complement the food and be enjoyed by all of your guests. Please join us for our tasting on Wednesday, May 25, 2 to 7 pm, to try some of our options that will pair perfectly with your grilled feast. Tip 1: You can’t go wrong with a sparkling wine. It’s a good choice for barbecue because it acts as a palate cleanser, much the way that beer can. Sparkling wine removes the richness and fat on your palate with acidity and coldness. Tip 2: Choose crisp, light-bodied, high-acid white wines like Riesling, Gruner Veltliner and Sauvignon Blanc for lighter grilled foods. Sauvignon Blanc is great with shrimp, and is the best wine with tomatoes. Off-dry Rieslings should pair nicely with spicier and sweeter barbecue flavors. Gruner with vegetable dishes is a good match. Tip 3: Go for a dry rosé wine. It’s an all-purpose barbecue and summertime favorite. Good rosés combine the crispness and refreshment of chilled white wine with flavors of red fruits, notes of tea, orange rind, strawberries and watermelon. Tip 4: The smoky, spicy and sweet flavors of barbecue sauce needs a bold, fruity and spicy red wine. Try a fruity bold American Zinfandel or Syrah. An Italian Chianti or Barbera, with their higher acidity, will handle tomato-based sauces. Tip 5: Shop for value for the reds. For the grilled meats without the sauce you can work with a wider range of reds. Although you might love a Napa Cabernet Suavignon, this is not the holiday or the meal to spend $40 a bottle. Look for affordable options such as Argentine Malbec, and Spanish reds. A chilled Beaujolais with a hamburger will hit the spot. Tip 6: Chill the Reds Too. It’s been on the cooler side this month, but if it gets hot don’t be afraid to chill the reds slightly. When you chill a wine with big tannins it is more refreshing. Sustainable, Organic, Biodynamic and Natural Wines: What do the Terms Mean? Sustainability is the idea that all farming practices should preserve the land and make the most efficient use of non-renewable resources to provide for current and future generations. Sustainability refers to a range of practices that are not only ecologically sound, but also economically viable and socially responsible. There are wineries that simply call themselves sustainable, but are actually organic. They may have chosen not to go through the long and costly process of becoming certified organic. While there are no set standards for sustainable farming there are third-party agencies that offer sustainability certifications such as the Certified California Sustainable Winegrowing certification program. To learn more visit: .http://www.sustainablewinegrowing.org/. Growers of organic grapes do not utilize chemical fertilizers, pesticides, herbicides, fungicides or genetically modified seeds. In order to be certified organic, a farm must not have utilized any of these products for at least three years. A variety of ground cover plants, extensive use of compost and natural products are used to control pests and insects. There are many small artisanal producers that grow grapes in the spirit of organics, but are not legally certified. “100% Organic”: The wine is made from 100% certified organic ingredients, processed without synthetic agents and contains no added sulfites*. Naturally occurring sulfite levels in these wines must be less than 20 parts per million. The label will bear the USDA 100% organic seal. “Organic”: The wine is made with 95% certified organic ingredients, and contains no added sulfites. Winemakers must prove that certified organic ingredients aren’t available for the remaining 5% of ingredients. The label will bear the USDA organic seal. “Made with Organic Grapes”: The wine is made with 70% certified organic ingredients, and sulfites can be added up to 100 parts per million. The label can't bear the USDA organic seal. For more information, visit http://www.usda.gov/wps/portal/usda/usdahome?navid=organic-agriculture and http://www.ccof.org/certification. In 1924, the basic principles of biodynamic farming were established. The designation applies a holistic approach and philosophy that views farms and vineyards as self-sustaining ecosystems. It uses the teachings of Austrian anthroposophist Rudolf Steiner who spent his life studying the forces that regulate life and growth. Everything that is done on the farm should bring harmony to the organism, keep the soil healthy and preserve the farm for future generations. While practices such as water conservation and energy reduction are implemented, other cosmic influences often apply such as planting, pruning and harvesting crops according to lunar and astrological cycles. Biodynamic certification can be costly to attain, so just as with organic farming, many biodynamically prepared wines do not say so on the label. *Sulfites are preservatives, made from diluted mined sulfur, that prevent oxidation and bacterial spoilage. Because sulfites are an ingredient that can occur in wine naturally, and mined sulfites have been used in viticulture for centuries, their inclusion in organic wine is an area of contention.